The only wood chip smoker box that produces savory smoke flavour without catching fire. Engineered to allow just enough oxygen to produce smoke without generating flames. This allows the wood chips to slowly smolder, producing a nicer smoke flavour than other smoker boxes. Made from a durable heavy gauge stainless steel, and made for placement directly on hot charcoal, gas burners, electric grills. Holds up to 8 oz. of wood chips and can smoke for up to 1 hr. Also includes a removable handle to safely and easily place the smoker box on your heat source, or remove it from the grill to replace the wood chips. Wood chips sold separately. Nothing even comes close to the flavors of foods smoked outdoors in the King Kooker Model # 2113 Heavy Duty Low Pressure Propane Smoker. Great for Camping and Tailgating! Beef, Chicken, Pork, and Fish all smoke to perfection in the smoker's large 30 inch cabinet. Tight fitting door and locking door latch seal the heat and smoke inside the cabinet for maximum flavor. On the smoker door a large temperature gauge, and two heat saving viewing windows eliminate unnecessary door opening when checking the cooking progress. Included are 2 Sliding Cabinet Racks, and Removable Porcelain Plated Water and Wood Chip Pans. The unit includes an easy start Piezo Lighting system, 16,000 BTU steel burner, and low pressure UL Listed LP Hose and Regulator with Type 1 Connection. CSA Design Certified Unit. King Kooker Outdoor Cooking Products provides a complete line of smokers, accessories, seasonings, and rubs to satisfy the appetite and keep you coming back for more! Endless Food Smoking Possibilities! Protect your barbeque from harsh weather and debris. Made from weatherproof vinyl/polyester material that reverses from grey to black. This cover features mesh ventilation that prevents damaging condensation from building up on the barbeque by allowing moist air to escape. Easily fits over your grill and has Velcro tie down straps to keep it secure. Comes with UV protection and anti-cold crack, and convenient hanging loop for storage. Smoker in Flameless BBQ Smoker Set The only wood chip smoker box that produces savory smoke flavour without catching fire. Engineered to allow just enough oxygen to produce smoke without generating flames. This allows the wood chips to slowly smolder, producing a nicer smoke flavour than other smoker boxes. Made from a durable heavy gauge stainless steel, and made for placement directly on hot charcoal, gas burners, electric grills. Holds up to 8 oz. of wood chips and can smoke for up to 1 hr. 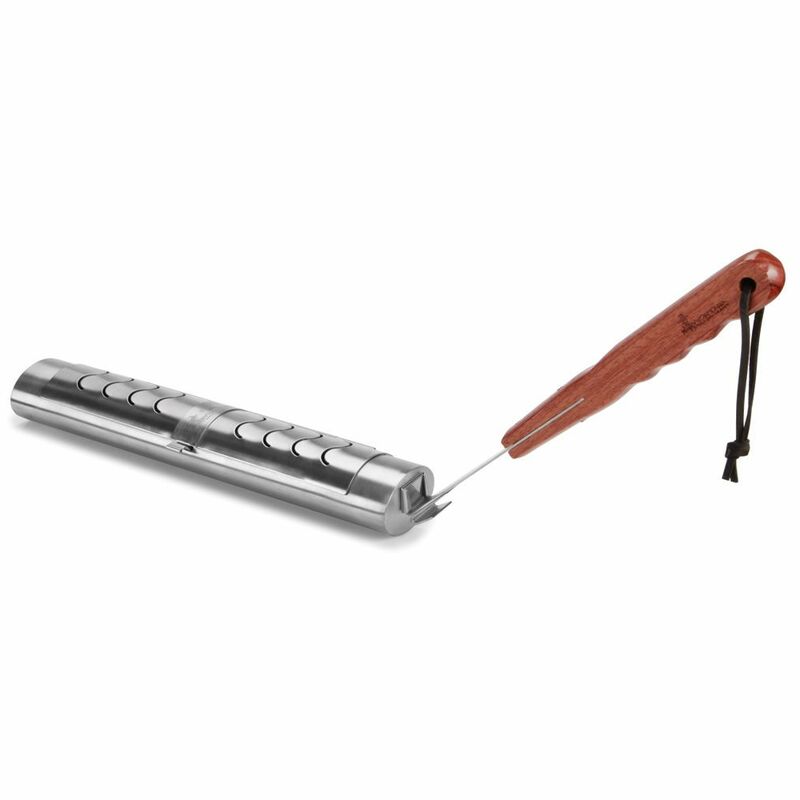 Also includes a removable handle to safely and easily place the smoker box on your heat source, or remove it from the grill to replace the wood chips. Wood chips sold separately.